Remember my aunt shared with me several bushels of sweet ripe apples from her backyard tree? Well y’all, I’m still working on getting all of those delicious apples preserved. One of my easiest go-to things to do with lots of fresh apples is to use my slow cooker to make homemade applesauce. I take those apples that might be not quite right for eating fresh or pretty enough for making apple pie filling and turn them into applesauce. You know the ones, those beautiful apples that maybe have a wind-fall bruise or small bird peck that needs to be cut out? None of that matters if I’m making applesauce! I like to use plain unsweetened applesauce as a delicious snack and also as a replacement for some of the oil I use when baking. But I have a LOT of applesauce and I’m thinking about maybe using some of it for an even sweeter treat: Cinnamon-Vanilla flavored applesauce. It couldn’t be easier, check it out! Preparing The Apples In A SNAP! First I peeled/cored/sliced the apples I wanted to cook using this handy *Apple Peeler/Slicer/Corer. Now I’ve said it before and I’ll say it again – this little dude makes the tedious chore of preparing apples for cooking into a lightning-fast thing. RancherMan & I could peel/slice/core an apple in seconds! Then I trimmed any areas that needed to be discarded and tossed them into my composter. Then I made my homemade applesauce in a slow cooker. I canned that unsweetened applesauce so I could enjoy it all winter long. But I wanted to make Cinnamon-Vanilla flavored applesauce as well. So I took six cups of my leftover applesauce, added 1/4 cup sugar, a tablespoon of cinnamon and 2 tablespoons of vanilla, blended it all together. Then placed it in 1/2-pint canning jars and canned it in a water-bath canner for 20 minutes. Since there are variables to canning such as altitude and equipment be sure to follow your canners recommendations for your area. Food safety is important! I love that I’ve very inexpensively provided my family a sweet treat containing only healthy ingredients. Plus the environmental side of me loves that these sweet treats don’t involve tons of landfill-bound trash like their commercial counterparts. The glass canning jars can be washed and reused time & time again. And I even canned some of them using my reusable *Tattler Canning Lids! Now that’s something that makes my crunchy-green heart smile! This entry was posted in Blog Posts and tagged Environment, Fall, Food Preservation, Frugality, Make-It-Yourself, Recipes on September 19, 2015 by Texas Homesteader. My Granddaughters and I would eat this all up…there would not be any left! Thanks for sharing on My 2 Favorite Things on Thursday and I hope to see you tomorrow! Pinned! I bet your house smells amazing when you make this. Thanks for linking up to Simply Natural Saturdays. 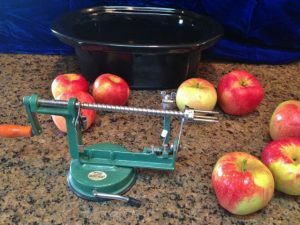 You have all the cool little gadgets…now I want an apple peeler like yours too!! Thanks for Sharing on My 2 Favorite Things on Thursday!! Pinned! Hope you come back tomorrow!! I do love that thing Elaine. It makes pretty quick work out of the most tedious tasks when putting up apples and pears. 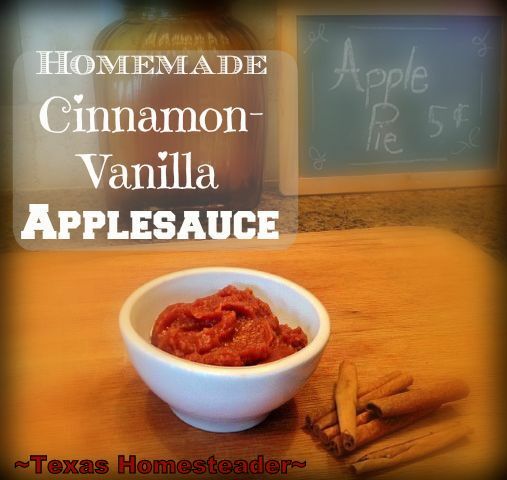 I love making homemade applesauce and the cinnamon/vanilla adds and extra twist. Thanks for sharing on the Homestead Blog Hop. Ohhh sounds so delish! I have some plans to can some applesauce and this will be a great recipe to follow! Give it a try – it’s eeeeeeeasy! Yum! This sounds delicious. Thanks for sharing with us at the Merry Monday link party. I hope you’ll join us again next week. Sharing your post on Twitter! Awesome Ashley, thanks for the tweet. You had me at cinnamon and vanilla! That looks wonderful. I’ve never been good at making apple sauce but I just might have to try your recipe. Thanks for sharing! That looks delicious! I just picked up some apples from the orchard. I might have to try this recipe if I don’t wind up using them for something else first. This looks delicious! I used that glut of apples my aunt gave me for several different things Jamie – Plain Applesauce, flavored applesauce, apple butter, apple pie filling and dehydrated apples. We’re hoping to include them in our homemade Christmas baskets this year. Also, in place of using cinnamon add some red hots (candy) in with, while cooking the apples. I don’t measure the amount of red hots. I just toss in maybe a handful (more or less). Seems like I’ve done that before too Colleen, years ago. Delicious!